There are a variety of small dog breeds that might make the perfect canine companion for you and your family. I have not listed them in order of popularity as this is an ever changing list of toy dog breeds or what many referred to as “designer dogs“. Since I do breed Chihuahua they are placed first on my list. The Chihuahua is among the smallest of the small dog breeds, their weights can vary from 2 ½ to 10 or more pounds with 5 to 6 pounds being the norm. They can easily be taken along on trips or other outing. They make excellent watch dogs and are very protective of their home and family. Apparently unaware of their own small size have been known to fearlessly take on much larger animals. Chihuahua personalities vary considerably, some being extremely friendly and docile, others being very cautious and mistrustful of strangers. Early socialization and Chihuahua training is particularly important for this breed. Although the Shih Tzu breed tends to bark less than the other toy dog breeds many of them snort frequently and are known to snore loudly for such small dogs. They are quite friendly with a tendency towards being strong willed making training a challenge. They interact well with people and other pets as a general rule. Like some of the other small dog breeds they require a lot of grooming to look presentable. Visit www.entirelyshihtzu.com to learn more about this wonderful little breed. A very informative and interactive guide all about Shih Tzu dogs. Get information on the Shih Tzu breed, Shih Tzu rescue groups, shih tzu grooming and much much more. This small toy dog breed is quite lively and playful, known for its intelligence and quick response to training. The Papillon like many of the toy breeds tends to be quite fearless, weighing in at around five pounds, and will sometimes challenge dogs much larger in size. A generally happy, affectionate dog if given the proper guidance and attention. One common characteristic as with most of the small dog breeds is the potential for excessive barking. The Toy Poodle is considered to be one of the most intelligent of all dog breeds. They are not only eager to please and highly trainable, but also excel at obedience and agility. They have a long history of performing in traveling shows due to their intelligence and agility. This toy dog breed interacts well with both people and other animals making it a very popular pet. They do require a bit of grooming time. This tiny toy dog breed is very energetic and doesn’t require a lot of added exercise since they create their own by running and playing around the house. Yorkies generally get along well with both people and other animals, they due tend toward excessive barking if not trained properly. Due to their small size and energetic nature these tiny dogs may be easily injured. A poorly socialized Yorkie tends to be mistrustful of strangers and may react by biting, so early socialization is very important with this toy dog breed. Extra grooming may also be a consideration. 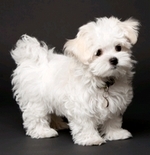 The Maltese is somewhat more reserved than the other small dog breeds. Their mistrust of strangers makes early socialization extremely important. When properly socialized, they interact well and tend to be lively and playful. Like the other toy breeds, they are notoriously hard to housebreak and prone to bark at the slightest provocation. They are quite happy to live in small quarters making them great apartment dogs. So there you have a list of 6 of the most common toy breeds with a short description on each. I can understand why and how this happens, and if you have one of these adorable small breed dogs as a family member so do you. Just keep in mind; it is never too late to regain control.